Who invented the Franklin Stove? The name of the person credited with inventing the Franklin Stove is Benjamin Franklin (1706 - 1790). 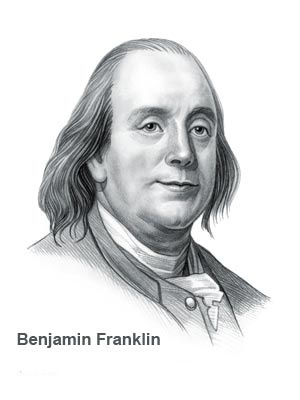 Benjamin Franklin is not only famous as an American inventor but also as a scientist, statesman and politician. When were Franklin Stove invented? The Franklin Stove in 1742, during the First US Industrial Revolution (1700 - 1860) period of invention. The famous stove is also known as a "circulating stove" or the "Pennsylvania fireplace". Definition of the Franklin Stove: The famous invention is defined as a type of freestanding cast open stove, designed to be inserted into a fireplace, the unique feature of which was that a current of heated air was directly supplied to the room from an air box. Fact 1: Who invented the Franklin Stove? The Franklin Stove was invented by Benjamin Franklin in 1742 during the First US Industrial Revolution era of inventions (1700 - 1860). He also invented Bifocals and the Lightening Rod. Fact 2: Who invented the Franklin Stove? Prior to the invention of the Franklin Stove in 1742, the majority of people in Colonial America warmed their homes by building a fire in a fireplace, which was inefficient, could be dangerous and used a lot of wood. Fact 3: Why was the Franklin Stove invented? Benjamin Franklin lived in Boston, Massachusetts, which had a history of local shortages of firewood that dated back to the first colonists. Fact 4: Why was the Franklin Stove invented? John Winthrop, who founded the Massachusetts Bay Colony, wrote in his journal about a firewood shortage in 1638 that resulted in a wood gathering expedition to Spectacle Island that resulted in one death and several cases of frostbite. Wood supplies continued to dwindle in Massachusetts and Benjamin Franklin became determined to use technology that would burn fuel cheaply, safely and more efficiently. Fact 5: Who invented the Franklin Stove? Benjamin Franklin, was born in Boston, Massachusetts, on January 17, 1706 and died on April 17, 1790. Fact 6: Who invented the Franklin Stove? The early years of Benjamin Franklin were spent in Boston, Massachusetts where he was the 15th child of a family of 17 children.. His parents were Josiah Franklin and Abiah Folger Franklin. The young Benjamin Franklin attended Boston Latin School for only two years and educated himself through reading. Fact 7: Who invented the Franklin Stove? Ben started work in his father's candle shop when he was just ten years old and at the age of twelve years he was then apprenticed to his brother James printing shop in Boston. Ben had access to numerous books via the printers, became extremely well read and developed a passion for politics and science. Fact 8: Who invented the Franklin Stove? In 1726 Ben established his own printing business and eventually became a successful and wealthy man. He had time to pursue both his political and scientific interests and in 1742, at the age of 36, he created his first major invention, the "Pennsylvania fireplace" which would later become known as the Franklin stove. Fact 9: Who invented the Franklin Stove? Due to the firewood shortage that was threatening so many colonists Ben put his mind to using his scientific knowledge to replace the open fires in fireplaces with a more efficient, cost effective type of heat. Fact 10: Who invented the Franklin Stove? Ben's stove was like a metal-lined fireplace a hollow baffle near the back to transfer more heat from the fire to the room's air and an "inverted siphon" to draw the fire's hot fumes around the baffle. Fact 11: Who invented the Franklin Stove? Ben was inspired by the works of two scientists and inventors: Franz Kessler and Jean Desaguiliers. Fact 12: Who invented the Franklin Stove? Franz Kessler (c. 1580–1650) had invented an inverted siphon in 1618 and Jean Desaguiliers had established that metals such as cast iron could be used instead of masonry in a fireplace, radiating heat into a room. Fact 14: Who invented the Franklin Stove? The inclusion of metal baffles increased its heating efficiency. A 'Baffle' is a deflector, such as a plate or wall, arranged across a furnace or boiler flue to mingle the hot gases and deflect them against the substance to be heated. Fact 15: Who invented the Franklin Stove? Cool air entered through a hole in the bottom cast iron plate (Baffle). The cool air warmed in the air box, which was heated by wood burning in the fireplace. Fact 16: Who invented the Franklin Stove? Heated air entered the room by means of ventilated cast iron side plates. Fact 17: Who invented the Franklin Stove? Ben's "Pennsylvania fireplace" was successful but there was a flaw in the design due to smoke. The stove was designed so that smoke came out from the bottom of the fireplace before ascending in the flue. However, the smoke was unable descend unless the floor was relatively warm, which resulted in the smoke backing up into the stove and straight into the room. In the 1790's another inventor from Philadelphia David R. Rittenhouse improved the design of the Franklin Stove by adding an L-shaped chimney. Fact 18: Who invented the Franklin Stove? Enthused by his ideas for new inventions Ben founded the American Philosophical Society in 1743 to encourage scientists and inventors to discuss their discoveries and theories. Fact 19: Who invented the Franklin Stove? Ben went on to invent invented the lightning rod conductor in 1747 as part of his pioneering exploration of electricity. Another of his inventions were Bifocal spectacles that he invented in 1784. Fact 20: Who invented the Franklin Stove? Ben retired from printing in 1747 and began to manufacture some of his new inventions. His free time allowed became involved in politics and on n July 4, 1776 he was one of the 56 delegates to the Continental Congress, who signed the Declaration of Independence. Fact 21: Who invented the Franklin Stove? Benjamin Franklin died on May 14, 1790 in Philadelphia, at the age of 84. He is remembered as a Founding Father of the United States of America, a great statesman and a famous inventor whose inventions included the Lightening Rod, Bifocals and the iconic Franklin Stove. Who invented the Franklin Stove - Inventor - Invention - Definition - Meaning - Famous - Important - History - Timeline - Innovation - Significant - Development - First - Definition - Kids - Facts - Information - Info - Who invented the Franklin Stove - Dates - When - Why - Stove Impact - Stove Purpose - Use - New - Old - Amazing - Best - Definition - Meaning - Awesome - Cool - American - History - Timeline - Who invented the Franklin Stove?